Above & Below: CQ's Silver Taupe is a fantastic taupe with a little bling. I used 2 coats, but it would have looked much better with 3. These photos are taken in natural light (above) and with a flash below. 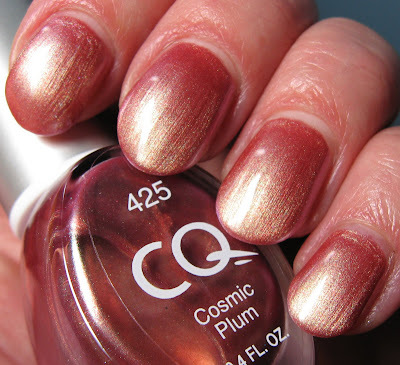 Below: CQ's Cosmic Plum is a very slight duo chrome. It's got a lot going on, because in addition to the slight duo chrome, it's also a shimmer, yet it has a somewhat foil-type finish. I do like how the shimmer gives it a plush velvet look. Silver Taupe is just gorgeous to me. A medium taupe shade with silver sparkles. The sparkly glitter is subtle, but it is also slightly holographic under more intense lighting. What's not to like? Again, other than the 3 coats! 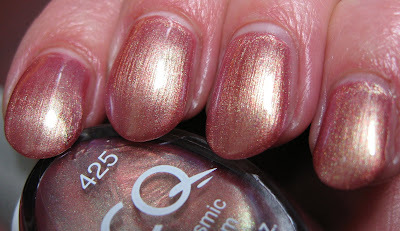 It was similar to China Glaze Stellar, which was one of my favorites from the glitters they released a few months back. Here is my post on Stellar if you'd like to have a look. Cosmic Plum was just alright to me, but nothing special. It looked somewhat like a duo chrome in the bottle, and once applied, it actually is a duo chrome. But it's a very weak duo chrome. It's a rose gold color that flashes to a more gold color in different lighting. It also has hints of copper in darker lighting. The metallic/foil finish is not to my liking either. I don't hate it, but I'm not nearly as attracted to this one as I am to Silver Taupe. I think I was expecting a little more magic from Cosmic Plum, based on how it looked in the bottle. Both are lovely colors and your nails are looking great! I have silver taupe as well but i just haven't worn it yet. Pretty! Definitely my kind of color! Both of those colors are gorgeous! Oooh I am loving Silver Taupe! I don't know why but those neutrally sparkly colors really appeal to me! I like them both. Fantastic looking nails. Hope your getting your shelf cleared. Did you order the RBL's? I ordered 7 and finally got the Locavore that I wouldn't pay $18 for! Yipee! 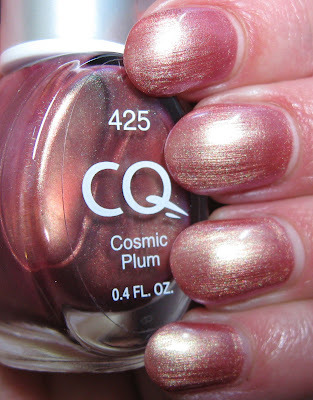 I dunno about the Cosmic Plum, it's not really my thing, but I LOVE that Silver Taupe! It's gorgeous! gildedangel~thanks! They make some unique shades...not too many, unfortunately! I wish they made more like Silver Taupe. Ayuu~this is very nice and the silver sparkle gives it a perfect look. Nicole~I'm with you! Poor Cosmic Plum, I'll have to give it another try. Silver Taupe got all the love!